This Eastman home has been lovingly updated over the last ten years. A level driveway leads you to the perfectly sited home with your privacy protected by the double lot. Enjoy the deck or three season room in total privacy; there are no neighbors to be seen. 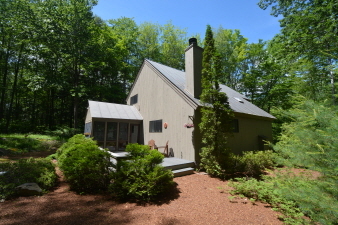 The property has wonderful landscaping including a small pond with waterfall to give you the sound of a babbling brook. The interior is light, bright, and sun filled. There is a beautiful cherry kitchen with granite tops and stainless appliances. The kitchen is open to the dining area and living room. The living room has a vaulted ceiling for that grand space feeling and a fireplace to set the perfect mood. A first floor master bedroom has ample space, the bath has double sinks with granite and tile updates. The 2nd floor has a loft that is open to the living room, two bedrooms and an updated bath with tile and granite. The lower level offers a family/game room, a workshop and laundry room. This home is perfect for full time living or a vacation getaway.